Face front, true believers! The Captain has made her return and oh, how mighty it is. 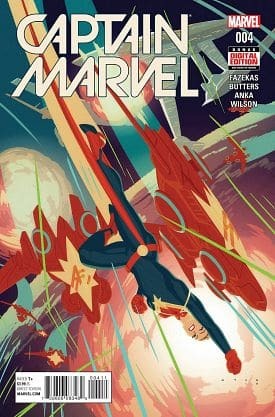 It's a bold new frontier for Carol Danvers as she soars to new heights in her greatest mission yet - leader of the all-new Alpha Flight space program. Yup, Alpha Flight. As earth's first line of defense, Carol and her team aim to protect the planet from extraterrestrial threats. But can Carol be a soldier and a diplomat? Especially when an unknown enemy emerges that Carol can't quite punch.